Having worked closely with WyeTec on the development on their web site, Centri-Force chose WyeTec to develop a new Intranet / Extranet based Customer Relations Management system (CRM). WyeTec played an important role in specifying the software project details, by identifying the business processes involved within the organisation, and also developed the entire system. The project was initially driven by a customer requirement to make available information on the supply and maintenance of equipment, and on the cost of ownership of each piece of plant. From the onset, it was clear that to make this data available, a relational database holding information about customers, sites, equipment owned, maintenance schedules, billing information and much more was going to be required. Moreover, it was instantly apparent that this information would have a much wider value within the organisation, and was applicable to all customers. A management decision was therefore taken to capitalise on this and provide additional tools for the business. Left: On successful authentication, a simple gateway directs users to the key components of the system. 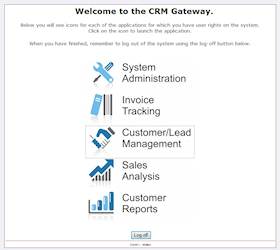 Left: Designed as a web-based application, the CRM manages customers and contacts, sales leads and analysis, equipment maintenance and supplier invoicing in one package. The CRM is built on a Microsoft SQL Server database, with an ASP.Net (VB.Net) built user interface. The software application is hosted on one of WyeTec's servers, securely co-located in a professional data house. Key features of the software architecture are that sales/lead/customer data is held centrally, and is accessible to authenticated users both within, and externally to the company site. A system of user rights and .Net forms authentication governs who can access which parts of the system. Developing the system as a web application allows remote users to access the system with no need for installing a desktop-client. 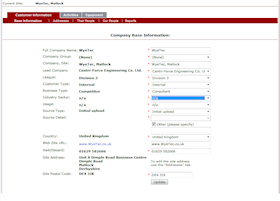 Contact WyeTec today to discuss your intranet/extranet CRM project or proposal.